Thanks to Andrew Fusek Peters for the beautiful photograph. 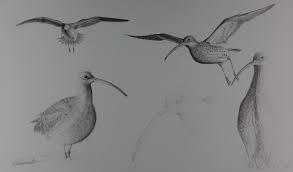 I have always been fascinated by the curlew and its evocative call. I feel so saddened by the drastic decline in numbers that I have decided to take time out and walk from the West coast of Ireland through Wales to the East coast of England to raise awareness about its plight, and also funds for the projects running to protect this beautiful bird and its habitat. 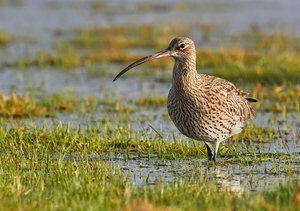 Curlews are the UK's largest wading bird, about the size of a herring gull on long legs. They are predominantly brown, but closer inspection reveals an intricate patterning of brown, cream and grey that shifts in hue with the sun. In the winter you'll see many around our coasts and estuaries, the numbers boosted by winter visitors from Finland and Scandinavia. Come the Spring however, most of these return home to breed and our own birds head for the meadows and hills to nest. Their scientific name is Numenius arquata. Numenius means new moon and arquata means bow-like - they refer to the shape of the bill. The female's bill is longer than the male's allowing them to feed on different creatures buried in mud and soft sediment. They are sensitive and open independently at the end, which looks quite odd - but this allows them to feel for hidden worms, crustaceans and snails. 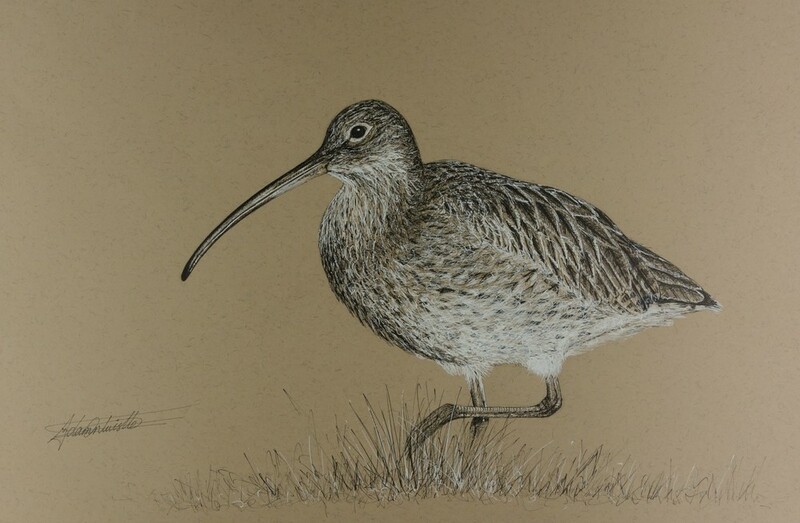 These wonderful studies of a curlew are drawn in pen by wildlife artist Adam Entwistle. 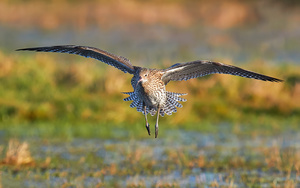 Curlews are particularly known for their evocative calls which embody wild places. They have a wide variety ranging from "curlee, curlee," from which it gets its name, to the rising, bubbling trill which can be heard over moors and marshes, particularly in the breeding season. They provoke a range of emotions that many have expressed in poetry, art and music. Thanks to renowned wildlife sound recordist Geoff Sample for providing these recordings. This piece of music was sent to me by composer Peter Bagshaw, it is based on the call of the curlew. There are thought to be around 68,000 curlew in the UK, but that number belies a deeper story, theyare falling each year. Ireland has lost 97%, Wales 80% and England and Wales over 50%. Of all bird songs or sounds known to me there is none that I would prefer than the spring notes of the Curlew…The notes do not sound passionate they suggests peace, rest, healing joy, an assurance of happiness past, present and to come. To listen to Curlews on a bright, clear April day, with the fullness of spring still in anticipation, is one of the best experiences that a lover of birds can have. On a still day one can almost feel the air vibrating with the blessed sound. There is enough evil in the crying of wind.